At Twynham we hope to achieve two things through our teaching of Geography. Firstly, we hope to instil a genuine love of the world around us in our young people, hoping that this will continue well into their adult lives. Secondly, we want to give them highly transferable skills such as data interpretation and analysis, and develop their decision making skills. 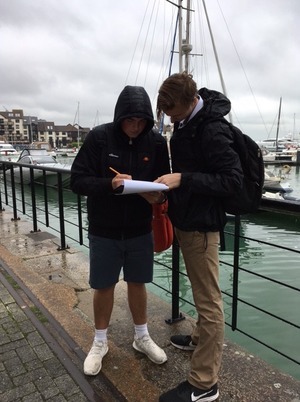 What is it like to study GCSE Geography? - Papers 1 and 2 are the knowledge and application papers. They focus on physical and human geography. - Paper 3 is the fieldwork paper. Students are required to undertake one day of fieldwork in a human environment and one day of fieldwork in a physical environment. They are then examined on this in this paper. This course would suit students who are interested in understanding the world we live in. There is a particular focus on the way in which people impact the environment. Geography would suit someone who is happy to ask lots of questions and find the answers, and who is interested in teamwork and social awareness. A lot of emphasis is placed on using data to make decisions and undertaking statistical testing. You will study a range of physical and human Geography topics including river and coastal processes and landforms, weather hazards and climate change, ecosystems, and social and economic development issues. Content will be based both on the UK and further afield. Field trips are an important part of the course and all students are required by the exam board to complete 2 days in the field. We will visit an urban area, a coastal area and also offer an optional residential field trip to Snowdonia. Students will explore key issues facing our planet, including the harm done by humans as well as discovering different ways that people are working sustainably to solve these problems. They will also learn how to form opinions and present justified arguments based on a range of data and their growing body of knowledge. This will eventually lead to an ability to evaluate schemes effectively drawing on a range of concepts from across the varied units of study. This unit encourages the development of map skills. Students learn about the local area and how and why settlements have developed and changed over time. Students study different climates and ecosystems around the world, and in doing so develop their graphical skills. They also conduct a microclimate study in the school grounds. During this unit we explore the key features of this continent and its animals as well as the impact of humans. Building on the map work covered in Y7, students study the physical geography of the World and some of the main countries. During this unit, we look at local and national flood events and flood management. We also study the water cycle and river features. Students develop an awareness of this rising nation and the issues it faces in the future regarding the sustainability of development. We look at renewable and non-renewable energy resources, local, national and international changes in energy use and collaboration with other countries. We aim to develop an understanding of different types of industry and how the employment mix varies between countries of different development levels. This leads to a focus on the tourist industry. This unit comprises a study of coastal processes, landforms and management and culminates in a trip to Hengistbury Head in order to complete a geographical enquiry. A range of natural hazards are studied, with in depth work on earthquakes, tsunamis and volcanoes. Focus is on hazard management and mitigation and challenges for hazard management in the future. Ways of measuring development, investigation into why some countries are richer than others, an investigation into whether aid or fair trade is better for helping development. Developing and awareness of globalisation through the spread of the fashion industry and a range of sporting activities. A study of both the physical and human features of the Middle East enabling students to understand the challenges faced in this region.